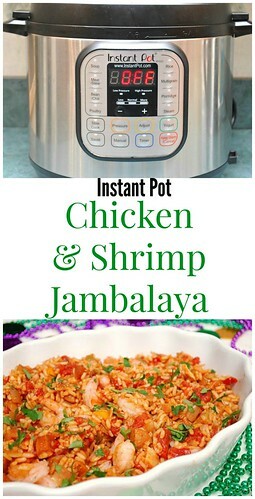 Who say's it has to be Mardi Gras to have Jambalaya on the menu?! I've been craving New Orleans fare and found the following recipe on Cook's Illustrated. As predicted, this was spot on with not too much spice, great flavor and perfect as a meal all on it's own. I made this in the Instant Pot and loved the results more than when I made it traditionally on the stove top. If you wanted, you could even prepare this dish using pasta in place of the rice. To do so, prepare the recipe as follows without the rice. Boil your choice of pasta separately. When your pasta is done and drained, top with the tomato, chicken & shrimp mixture. Toss to combine and dig in! In the bowl of a food processor, pulse onion, celery, bell peppers, and garlic until chopped fine, about six 1-second pulses, scraping down sides of bowl once or twice. Do not overprocess; vegetables should not be pureed. Press SAUTE on the IP and heat 1 tablespoon oil until shimmering. Add chicken, skin-side down, and cook until golden brown, about 5 minutes. Using tongs, turn chicken and cook until golden brown on second side, about 3 minutes longer. Transfer chicken to plate and set aside. In the now empty IP, add andouille sausage and vegetables; cook, stirring frequently, until vegetables have softened about 3-4 minutes. Add rice, salt, thyme, and cayenne; cook, stirring frequently, until rice is coated with fat, about 1 minute. Add tomatoes, reserved tomato juice, chicken broth, and bay leaves; stir to combine. Remove and discard skin from chicken; place chicken, skinned-side down, on rice. Press RICE and allow the IP to complete cooking for the preset 12 minute duration until it beeps. When the IP has beeped after cooking 12 minutes, allow your IP to naturally release pressure completely (allow several minutes for this to complete). While naturally releasing pressure (also known as NPR or NR), the display will reflect numbers counting up from 1. The numbers indicate how many minutes the IP has stopped cooking since it beeped (or how many minutes it has been naturally releasing pressure). No need to touch your IP while it naturally releases pressure. The pin at the top of your IP will drop when all pressure has been released and it's safe to open. Using tongs, remove chicken from pot and transfer to a plate. Using 2 forks, pull meat off the bones and into large chunks and set aside; discard chicken skin and remove remaining fat from chicken pieces. Return deboned chicken to IP along and top with shrimp. Press MANUAL and adjust the time to 2 minutes on HIGH pressure. Once at pressure, the display will reflect 2 (the number of minutes you initially set) and will begin to countdown to 0 minutes. When the IP beeps after pressure cooking for 2 minutes, turn the setting on top of your IP to VENTING. Doing so allows the IP to quickly release any remaining pressure (also known as QPR or QR). I use a wooden spoon to carefully turn the setting to avoid close contact with the potential steam. You may also want to turn your IP away from cabinets to allow the released steam to escape freely. The pin at the top of your IP will drop when all pressure has been released and it's safe to open. Stir in parsley and serve immediately. Tried this recipe and had a few problems with it. The ingredients list has "2 teaspoons vegetable oil" that doesn't seem to be used anywhere. It is what's referenced in "heat 1 tablespoon oil until shimmering"? Also, after switching from SAUTE to RICE my IP wouldn't pressurize even though it seemed to have lots of liquid. I think the recipe eventually just cooked itself in the hour or so that I waited. After adding the de-boned chicken and shrimp it, again, wouldn't pressurize. And, again, the dish just cooked. Taste was ok. It wasn't a complete waste, but the rice was mush. Please ensure your IP is sealed/positioned correctly to ensure that it pressurizes. It's possible that the reason the rice was mushy was because it sat in the liquid unpressurized for an hour when it should only cook under pressure for 12 mins.